When Paul told the Ephesians to “put on the whole armor of God” he did not mean the Ephesians have to become like Roman soldiers who wore literal armors. It is what Paul says about the armor that is the point. And I am afraid a lot of us may be missing Paul’s point. Or Paul’s use of metaphor. Do we know what this armor “looks” like? What does Paul tell us about God’s “mighty power”? Let me ask you about that phrase “belt of truth.” What came to your mind the instant you read it? Did you immediately think of something that people wear around their waists? If you did – and you are not along in thinking that way – then you just missed Paul’s point. The function[iii] of the word “of” in “belt of truth” is to define the noun, that is, the belt WHICH IS TRUTH! The same applies to the rest of the armor: the breastplate WHICH IS RIGHTEOUSNESS, the shield WHICH IS FAITH, the helmet WHICH IS SALVATION, the sword of the Spirit WHICH IS THE WORD OF GOD. The armor also includes the sandals for the feet WHICH IS THE PROCLAMATION OF THE GOSPEL OF PEACE. The “belt” and the “feet” and the “breastplate” and the “helmet” and the “shield” are imageries. The body is to be covered by the “full armor.” In other words, as in a military struggle, the enemy’s points of attack may include any or all of these points in the body. [iv] The enemy attacks the believer in the areas of truth, righteousness, the proclamation of the gospel, salvation, faith, God’s word. The believer can either be vulnerable or strong in these areas. God wants to make us strong in these areas. But we have to “put them on”! The believer must therefore remain strong in these areas: the word of God, truth, righteousness, faith, salvation and be always able and ready to proclaim the gospel of peace. The believer must continually be engaged in spiritual prayer for himself and for the Church, especially for those who bring the gospel to difficult, unfriendly places. These are the areas of spiritual conflict for the believer and for the Body of Christ. “This is why it says, ‘When he ascended on high he led captives in his train and gave gifts to men.’ (What does ‘he ascended’ mean except that he also descended to the lower earthly regions? He who descended is the very one who ascended higher that all the heavens, in order to fill the whole universe.) It was he who gave some to be apostles, some to be prophets, some to be evangelists, some to be pastors and teachers, TO PREPARE GOD’S PEOPLE FOR WORKS OF SERVICE, SO THAT THE BODY OF CHRIST MAY BE BUILT UP until we all reach unity in the faith and in the knowledge of the Son of God and become mature, attaining the whole measure of the fullness of Christ” (4:7-14, NIV). The believer is strengthened by the Lord’s mighty power (equipped or prepared “for works of service”) in and by the Church. The believer learns how to use the armor of God in the Church. The apostles, prophets, evangelists, pastors and teachers have been given by the risen Christ to the Church for the purpose of equipping the believers for “works of service.” Believers are to be always ready “so that when the day of evil comes, you may be able to stand your ground, and after you have done everything, to stand.” (6:13). Later, Paul commands the believers to be continually filled with the Spirit (5:19f). The Spirit-filled life is to characterize the Church[vi] (5:19-21), bring harmony in the home (5:22-6:9), and empower us for the spiritual struggle that we all face (6:10-22). Paul lifts the veil to reveal who our real enemies are. They are powerful spirit-beings. [vii] But they do not operate by long distance; they do not send drones. [viii] These spiritual aliens are here! And they are not here for social visits. They are here to “steal, to destroy, to kill.”[ix] They are here in the struggle for our souls! Have you seen images of hundreds or thousands of people attending church? [xii] Have you seen hundreds jumping up and down and having a good time at live concerts? [xiii] Have these brethren of ours put on the armor of God? Here is the urgency. The Church must know we all are in a fight! Every believer must receive equipping from the Church. Every believer must know what is in the Word of God, what it means and what the Word is for. Every believer must know his salvation beyond the shadow of doubt and how to share it. Every believer must be equipped and ready to “do good works.” Every believer must continue to be strong in faith,[xiv]live in righteousness and be ready to lend his voice for justice and for everything that is peaceful and just. The command to “put on the full armor of God” is addressed to the Church. All personal pronouns in this passage are in the plural. This includes you and me! No believer should stand alone. [i] I, for one, do not entitle the present Parable as “of the Sower.” I prefer to use “The Parable of the Hearer.” Here is why. Jesus himself concludes the parable in these words: “He who has ears, let him hear” (Matthew 13:9, all emphases mine). Later, when his disciples asked for the parable’s meaning Jesus used the following words repeatedly: “the man who hears the word” (13:20,22,23), and prefaces the interpretation with: “When anyone hears the message of the kingdom…” (13:19). [iii] The noun in “word of truth” is a genitive. There are different uses of the genitive in Greek. It can indicate possession (“the book of Peter”), or as objective genitive (“the love of God” would refer to God as object of one’s love), or as subjective genitive (the love that God produces in our hearts). Or as genitive of definition, which is the likely case here in Ephesians. The “armor of God” is subjective; that is, the armor that God equips us with or the armor that he produces in our lives. It is God’s design to imbue us with His power. 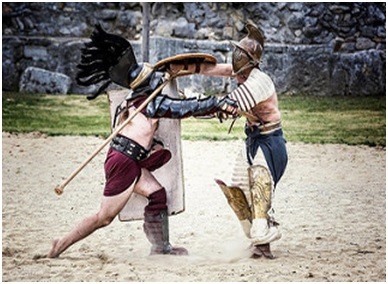 [iv] In ancient warfare as in martial arts the parts of the body that are “deadly” for the enemy are the head, breast, arms, groin, knee and feet (insoles). [vi] Note the important progression here: universal to particular. The development of Paul’s argument which ends in his commands to the Church in particular has their beginning in the revelation of God’s universal plan: “…he made known to us the mystery of his will according to his good pleasure, which he purposed in Chris, to be put into effect when the times will have reached their fulfillment – TO BRING ALL THINGS IN HEAVEN AND ON EARTH TOGETHER UNDER ONE HEAD, EVEN CHRIST” (1:9,10, emphasis added). This divine plan culminates in the work of the Spirit in and through the Church. [vii] In the Temptation of Christ Satan offered the “kingdoms of the world” to the Messiah: “All this I will give you,” he said, “if you will bow down and worship me” (Matthew 4:8,9). Jesus cut him down with the “sword of the Spirit”: “Away from me, Satan! For it is written: ‘Worship the Lord your God, and serve him only” (v10). Jesus called Satan “the prince of this world” (John 14:30), and Paul called him “the god of this age”(2 Corinthians 4:4). [viii] Too often the enemy speaks through persons around us. Remember what happened between Jesus Christ and Peter at one time? Read the account in Matthew 16:21-23. Or through religious leaders who, according to Paul, are really “false apostles”; like Satan they appear as an “angels of light” (2 Cor 11:14). Satan may also use suffering to attack the believer’s faith (see 1 Peter 5:8,9). [ix] Jesus casts the contrast between the Shepherd’s mission and the thief of the sheep in sharp relief. “The thief comes only to steal and kill and destroy; I have come that they may have life, and have it to the full” (John 10:10). [x] Some have observed that the armor equips the wearer for defense, that is, against frontal assault. The word for “struggle” is the Greek word pale “to throw,” used here only in the New Testament. AT Robertson says pallo means “to throw, to swing”; it is “a contest between two till one hurls the other down and holds him down.” The term “against” occurs 5x; pros is “face to face conflict to the finish” (AT Robertson, Word Pictures of the New Testament). [xi] The terminologies appear to refer to demonic hierarchy of rank or authority that are active in the heavens and on earth. They are all under Christ’s sovereign power and authority (see Matthew 28:18-20; Luke 10:18-20; Acts 10:38; Eph 4:10; Col 2:13-15; Heb 4:14-16; Rev 1:17,18; 12:7-9. [xii] A lot of TV and Radio speakers today are great motivational speakers, but are they preachers of the Word in the real sense? The exposition of the Word is losing ground in our Churches. Paul commanded Timothy to “preach the word” whether it is popular or not. [xiii] This is not a case against wholesome entertainment. But the Church must learn to major in more important things, in the stuff of eternal life. For instance, why are there more people going to concerts today (and willing to pay!) than there are who attend our prayer meetings? There is a spiritual dumbing down of our young people these days. Sights and sounds seem to make them come alive more than the plain, straight-forward teaching of God’s truth in their present form. I firmly believe this situation is grave and poses a challenge to the leaders of the Church today. [xiv] “This is the love for God: to obey his commands. And his commands are not burdensome, for everyone born of God overcomes the world. This is the victory that has overcome the world, even our faith. Who is it that overcomes the world? Only he who believes that Jesus is the Son of God” (1 John 5:3-5). The writer also warns the Church about “the spirit of the anti-christ, which you have heard is coming and even now is already in the world.” Then he assures us with these words: “You, dear children are from God and have overcome them, because the one who is in you is greater than the one who is in the world. They are from the world and therefore speak from the viewpoint of the world, and the world listens to them. We are from God, and whoever knows God listens to us; but whoever is not from God does not listen to us. This is how we recognize the Spirit of truth and the spirit of falsehood” (1 John 4:1-6).